BATON ROUGE, La. -- The U.S. Justice Department will lead the investigation into the killing of a black man shot to death by Baton Rouge police, Louisiana governor John Bel Edwards announced Wednesday. Alton Sterling was shot and killed early Tuesday outside a convenience store where he was selling CDs. Authorities say he was confronted by police after an anonymous caller said he saw a man threaten someone with a gun. In a cellphone video taken by a community activist, two officers had Sterling pinned to the ground, and gunfire erupted moments after someone yelled, "He's got a gun! Gun!" Edwards said the video "is disturbing to say the least." In a statement, the U.S. Justice Department said the FBI's New Orleans Division, the Civil Rights Division and the U.S. Attorney's Office for the Middle District of Louisiana have opened a civil rights investigation into the 37-year-old's death. Louisiana State Police will assist, Edwards said. "I have full confidence that this matter will be investigated thoroughly, impartially and professionally," Edwards said. Edwards urged calm in the wake of public outrage over the shooting. He said he had expressed condolences to Sterling's family, who is also asking for any public gatherings to remain peaceful. "It's a horrible thing, it's a horrible thing to happen to him," said Sandra Sterling, an aunt who raised Alton Sterling, at a press conference earlier Wednesday. "He didn't deserve that." The two officers who responded to the report of a gun threat had some type of altercation with the man and one officer fatally shot the suspect, Cpl. L'Jean McKneely said. Baton Rouge Police say Sterling was armed. Baton Rouge Police identified the officers as as Blane Salamoni, a four-year veteran, and three-year veteran Howie Lake II. They have been placed on administrative leave, which is standard department policy. The video that purported to show the shooting further fueled public anger on Tuesday, prompting hundreds to protest. The protest lasted into the night, with people chanting and holding up signs. Some may find the cellphone video disturbing and graphic. Sandra Sterling said Wednesday the video "made us realize what really happened. It shed light on everything we didn't know." She described Sterling as "a man who simply tried to earn a living to take care of his children." At one point someone can be heard saying, "He's got a gun! Gun!" 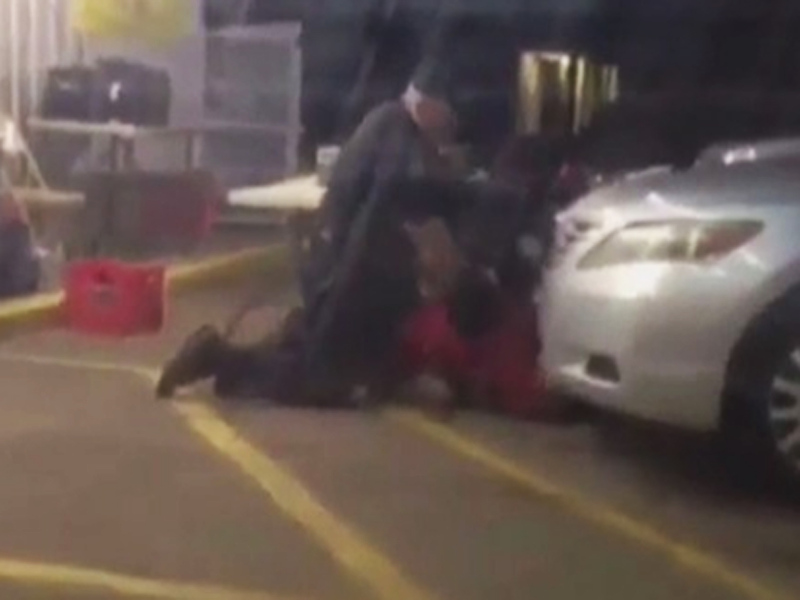 and then one officer on top of the man can be seen pulling his weapon from his holster. After some shouting, what sounds like a gunshot can be heard and the camera pulls away. Then another four shots can be heard. At one point, a person in the vehicle asks, "They shot him?" as a woman can be heard crying. CBS News has not been able to authenticate the video. But the appearance of the store in the video matches the front of convenience store where the shooting occurred. The man being subdued by police was wearing a red shirt, matching the description given earlier by police. Wednesday, advocates demanded justice and called for the officers involved to be arrested and charged with murder. Also at the Wednesday news conference, the head of the NAACP in Baton Rouge called for Police Chief Carl Dabadie Jr. to be fired. "What I'm calling for today is that the (mayor) to fire the police chief," Michael McClanahan said. "He must step down. We cannot have anybody who allows this type of action to take place." U.S. Rep. Cedric Richmond of New Orleans called earlier Wednesday for the federal investigation. In a statement he called the video "deeply troubling." Richmond said he shares the anger over the incident, which he said "has understandably evoked strong emotion and anger in our community." The Advocate reported the crowd that gathered late Tuesday afternoon at the store where Sterling died grew to more than 200 people. They chanted "black lives matter" and "hands up don't shoot," waving signs late into the night, according to the newspaper.